Ask any parents with young kids nearing the end of a three week vacation in rainy weather what their idea of fun is, I would hesitate to guess that both the kids and the parents would agree that taking part in a paintathon in a warm shopping center with child minders galore would be top of their list. 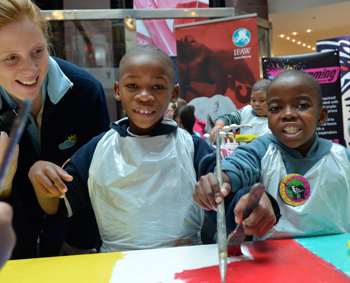 And that is just what was on offer on 11 & 12 July with the International Fund for Animal Welfare and Artjamming teaming up for the first time for a paintathon forming part of IFAW Southern Africa’s Animal Action Education Programme activities. Kids from all over the Western Cape were invited to take part in the IFAW Artjamming E is for Elephant paintathon which saw budding artists as young as five and kids up to 14 years of age expressing their creativity to highlight the plight of elephants around the world who are being relentlessly poached for their ivory. Even though most of them have most likely not seen an elephant in the wild before, there is something about the majestic image of an elephant that stirs something inside a person and this definitely shone through the paintings of the children. By chance, the importance of the event was further reitterated to all those present when a report was conveyed via a local radio station about the seizure of 46 elephant tusks with a value of around R12 million at Cape Town International Airport. Artjamming’s owner Leora Israel shared the reaction of the participants, “it brought everyone to a standstill for a few minutes, making everyone realise the reality of the situation and that their involvement with the paintathon was making a difference for these beautiful animals”. 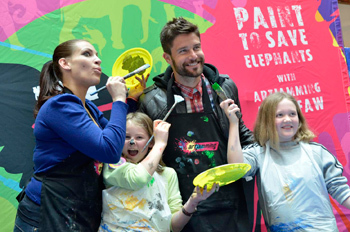 Day two’s events involved local television, radio and sports celebrities joining in the celebration of elephants by donning aprons and adding their splash of colour to doors. The celebs painted the doors side by side with youngsters including a group of children from the Reach for a Dream Foundation. A tiring day drew to a close, paint splattered hands and arms testament to the hard work put in by everyone and fun had by all, with a painted nose here and there a further giveaway. The children reluctantly leaving easals, brushes and paint-splattered aprons behind, some running back for their E is for Elephant badges, proudly clutching them, a reminder of the day’s events and the part they played for elephants everywhere, who continue to fall at the cruel hands of poachers.